My old Flickr.com account is public but disused, but since it’s free I set up a second one a few years ago to backup my digital photos in the cloud as yet another copy just in case. If you haven’t been reading along: Flickr offers free accounts with ONE TERABYTE of photo storage. So you can share them online. But that’s not required: You can leave some or all of the folders or individual photos private. Here’s some things about that process I have discovered or had to test out so I could feel comfortable with its behavior. Yes, you can rename folders inside Flickr after you upload and it seems to track that it was started with a differently named folder. This is useful in a case like this: I only wanted to upload a subfolder of say “2016_12 EVENT” called “EDITED”, and it displays as a folder tree in the app, but it uploaded as “EDITED” which I expected. The sync tool (and Flickr, really) doesn’t care about any folder hierarchy, just the folder it’s doing. So then I added the date and event value in Flickr for easier recognition and sorting. It did not pop back up in FlickrSync after this since the photos didn’t change. CAVEAT: Now that I have renamed the folder, the sync tool wants to see it as a NEW folder and add the photos in it as new uploads. Because you can put copies of photos or files with the same name in Flickr, it’s clearly looking at the folder name first then the files in each folder. Anyway, to complicate things I recently moved to a Network Attached Storage device (think a monitor-less computer that is generally giant hard drive storage with some service apps) which I have mapped to a different drive letter on my computer. It recognized the photos and folders when I started syncing from it, though I tried to do a clean changeover, that is I didn’t combine selections from both drives. Future uploads, previously from assorted computers, can now be done from the same universal storage location thanks to my giant storage NAS. But really that’s not a backup. It’s a convenient media dump. If it crashed I would lose so many things, if there weren’t copies strewn around. Make copies! but the sync tool still recognizes there is nothing to do. What if there is a folder with the same name in a different place? 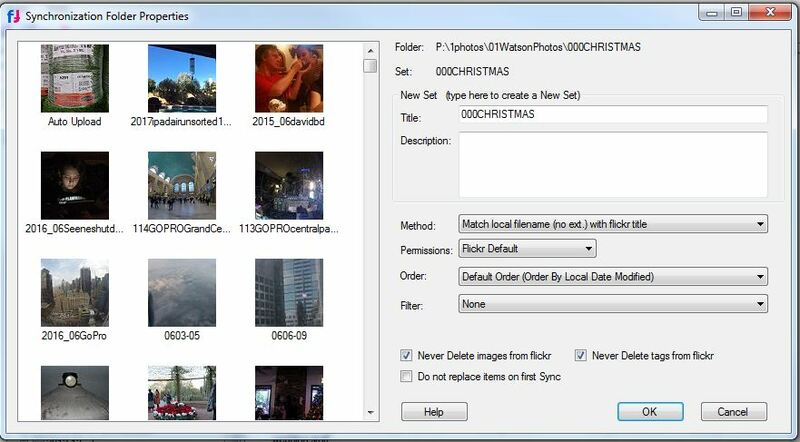 Well, if the photos are named the same in this same-named folder, the app says “Nothing to do.” If you have changed the name of the photos, OR if the folder is a duplicate name but the photos are not (say in a different number range) it will want to sync it. If the photo SHARES a name but it in fact a different photo (probably based on size) IT WILL STILL WANT TO SYNC IT! Which is great news if your photo ID number loops around or you like to reset it on shoots. P.P.S. Click here to get Lastpass for free (or the paid version, I don’t care) and start thinking about more secure passwords without losing the convenience of knowing what they are! Or check out a podcast like TekThing and see what other ones they have experimented with. Flickr offers free accounts with ONE TERABYTE of photo storage. And this then makes it easy to share your photos online. As I said, I set the upload tool defaults to set all uploaded albums and photos to private. After they are up there, I could change settings for them by folder or by photo, but I don’t feel the need to advertise the address so I haven’t yet. Someday I will leverage the rating system so find forgotten gems I forgot to share or need to use in something. The program likes to run full screen: I toggle the size to a window using the controls in the upper left. The icons on the right are the folders available, and if you double-click them it opens that very folder ON FLICKR! So you can see what’s up there already. Once you have selected your folders, you click the Sync menu item, then “View and Sync All” and it opens up a preview window with the files it wants to upload. In my case I usually see NEW or REPLACE (sometimes I edit inline — this can be just because I changed the rotation on a photo locally.) under the thumbnails. Confirm the choices by clicking sync and it will do it, or Cancel to edit them. It will sync and while it takes a while, there is a progress bar on the bottom and thumbnails get checked off as you go. You don’t have to babysit it. it will get back to you when done with messages that it is successful or not. If not, you can run the sync again — all your selections are still selected, this is very handy if you just had a network issue. Collections do not have this limit. You can also customize a Mosaic icon for collections with 12 images, making it pretty easy to find things visually. Oh, that’s the year we went there; saw that…. I do have Flickr installed on my Android phone and iPad, so those photos are also uploaded automatically, even before I copy them to my computer (for editing easier browsing and to keep them all together (before copying to my main local storage for convenient access and viewing). 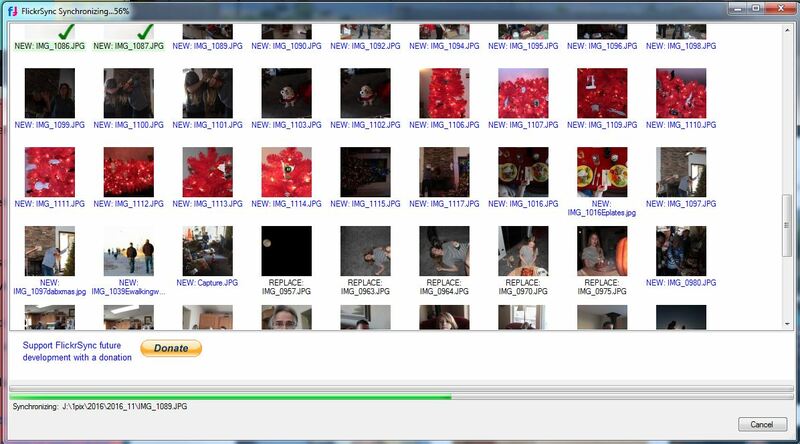 If you do that you can probably skip syncing that folder in the steps above, but I like to manage that part on Flickr. Apparently I have 116,044 photos online now, using 52.5% of my free terabyte of storage. Now that Verizon is buying Yahoo, I don’t know if that will change, but since they are all about getting you to use data (to upload and download and share) I am not worried. In any case, it’s free for now and my photos are safer because I have a backup. Will worry about changes when they happen. Their home page is here: Flickr.com. One terabyte, safe in the cloud and password-protected. * Free. This exploration will be continued in my next post, where we test the system and experiment to make sure it uploads what we expect and lesaves no photograph behind. Please bookmark, subscribe or follow me to tag along! Thanks! * Yes, Yahoo had a massive data breach a few years ago they didn’t reveal for a while. So have some other sites that still haven’t , you can be sure. We don’t actually know if the hackers shared the data, just that it wasn’t secure. Best practice for us means use a strong password and change it often. Keep ahead of that by using a password manager. I finally got comfortable with Lastpass which is free (not a trial) and can be had by clicking here. A few handy but not critical premium features can be had for a buck a month. I’m cheap and even I pay for them (like, you can share a folder of selected logins to other users –even free accounts.) My post on Lastpass is here if you want a simple overview. Get your ducks in a row and back up your photos, at least one copy, somewhere sort of safe! Start today for free! I have an old Flickr.com account that I haven’t used in a while, but a few years ago I set up a second one I keep private just as a backup of pretty much every photo I shoot. It’s not my only backup, but it is offsite, spacious and free. Why wouldn’t I do it? Well, if it took a lot of time, right? Here’s how I do it so it doesn’t take a lot of time. 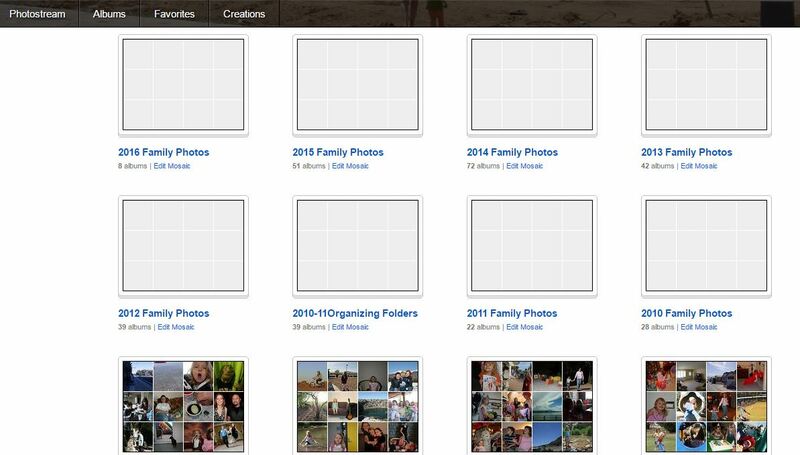 First: Flickr offers free accounts with ONE TERABYTE of photo storage. And this then makes it easy to share your photos online. But they don’t require that and there are some good privacy settings. Although Yahoo has has some leaking password issues, so use a good password and change it every so often. Good advice for everywhere. SIDENOTE: My post on the free Lastpass password management tool. It’s free, or for a buck a month you get some nice additional features. Just click here to get it and decide for yourself. Now back to Flickr: to backup my folders in an efficient way I use an app called FlickrSync which I got free from https://flickrsync.codeplex.com/ and though it hasn’t been updated in a while but still works. I set the DEFAULT for the FlickrSync app to add them privately; I don’t want to have to change it every time or forget to change it; I do try to confirm that every time. Also I have it set to never delete images. If I create a duplicate in a different folder or with a rename, I can catch it on Flickr later — I don’t want to automatically delete things without human intervention. I would rather have a second copy than none at all. Only one user on the account; that’s me. Maybe I will share with my wife someday, but she can see them when we are at home and doesn’t look for a five-year-old photo on her phone during a discussion just to punctuate a discussion. She’s a fine, patient woman. One of the things I like is when I have synced, I just close it, and when I reopen it it remembers what I had checked the the last time, so I can pick up where I left off, a week or months later. If I resync a folder that has pictures, it will add any new ones and not worry about the others (probably takes a little longer comparing, so I do uncheck them as I go if there is not going to be anything new in them.) Since I sort by months that’s pretty straightforward. I do have a 2016phone folder though, where I have offloaded all my phone pictures, sometimes it’s broken into folders of a few months at a time: that one I leave checked through the year and it keeps it up to date. For these problem files you can temporarily move them from the folder and back or rename the extension. I have also had luck trying the Flickr embedded web uploader for the tricky one and then the rest of the folder can be uploaded since it skips the existing image. But sometimes Flickr just doesn’t like the file. I’ll continue this FlickrSync backup discussion in future posts, where I’ll detail my process and do some experimenting, which I like to do with complicated things to improve my understanding and confidence in what I am working with. Please bookmark, subscribe or follow me to tag along! Thanks! P.S. My loose candid photos usually end up on my megawatson.tumblr.com page, alongside observations, comments and other amusements. Back when I had a LG flip phone and was a stay-at-home dad, I briefly fed a Flickr page, but also the late, lamented PicasaWeb, even before Google bought it. It’s been folded into Google Photos, with some better features but poorer ability to organize and manage, in my opinion. I put an event on Flickr a while ago to share with the organizers and participants, but I haven’t made time to curate a feed for it, and don’t want to simply duplicate the same stuff everywhere. Tumblr tends to be the big feed for user convenience, but even that doesn’t currently get all these Creative Upload posts.